On 8th March, we at The Working Capitol (TWC) joined the rest of the world in celebrating International Women’s Day (IWD); honouring their economic, political, and cultural achievements. We took the day to remind ourselves that this celebration was not a one-off matter, but rather a practice that should be instilled into our daily lives. Somehow along the way, we messed up, and the balance was tipped—placing one above the other; this IWD we sought to reify the fact that equality is for all and it is the strength in our unity that will help us achieve that balance. Starting our morning right at an attempt at seeking balance in the mind with meditation. Starting the day with an early morning meditation in The Commons, we gathered in the quiet space to enjoy the energy of like-minded individuals. Seeking solace and peace within our own community, the morning meditation session inspired strength amongst our participants and allowed them to clear their heads to conquer their day ahead. Attended by the superwomen of The Working Capitol, this morning session kicked off our IWD celebrations. We had fun with labels around our spaces. Although the IWD campaign could have very easily been done via a few posts on socials, a print out here and a poster there, we at TWC believe in the little things—the little touches like messages written in lipstick on mirrors and putting up cute little cards showing the motivations and drivers behind our women at TWC. Christine, from our partners at Pop Up Wine, took the reigns at our Beer Garden to pour all our members a glass of rosé. 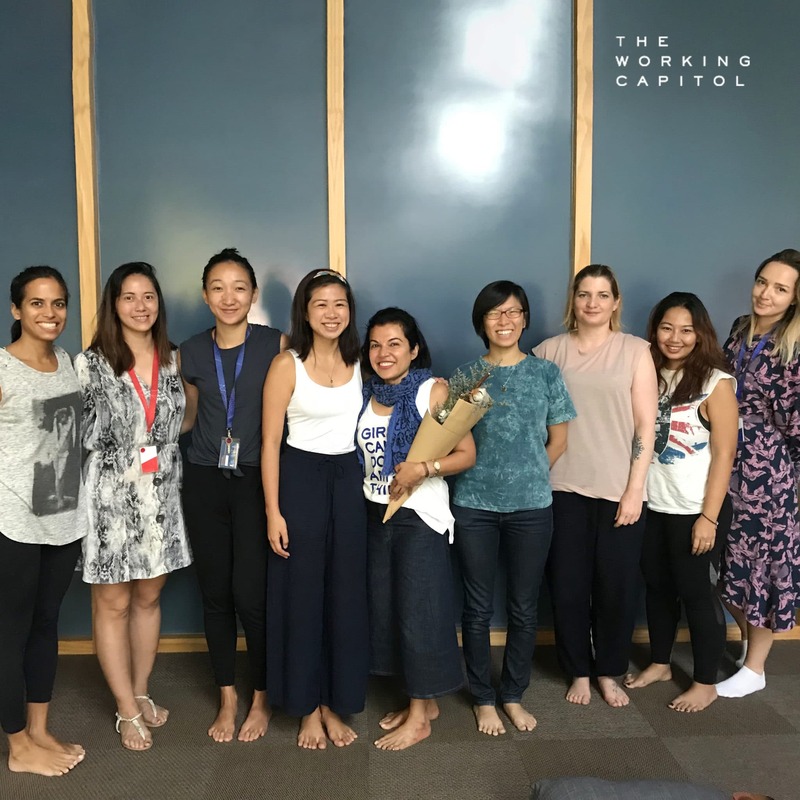 With the warm Singapore sun setting behind the historical buildings of Keong Saik, the IWD celebrations continued with all invited to join in for some drinks at our very own Beer Garden; having a bar attached to our offices has really helped us achieve that work-life balance at TWC. As the place filled up, Pop Up Wines kindly kept the Rosé flowing. The convivial spirit of TWC was ever apparent; where beautiful people were having a well-deserved drink. Even as the last few individuals streamed off, the spirit of the day remained ever present—a perfume now infused in the air we all breathed. As we at TWC attempt to #balanceforbetter for #IWD19, we learnt that the energy one creates when fostering equality and unity is unparalleled. Community remains at the heart of the work that TWC does, focusing on people, focusing on dreams. We are always looking to reinvigorate our own people and the larger community, should you think of an event that might be right up our alley, do not hesitate to contact us at [email protected] The Working Capitol strives to build bridges for all, for a better tomorrow. If you like our events our just curious as to what we are up to at TWC, follow us on our socials today! Read about our previous event, Stupid Cupid Pub Crawl here, join us on Instagram @theworkingcapitol, or follow us on Facebook and LinkedIn! There never is a dull day here at TWC, catch you all soon! Meditation in the morning, led by our friend Tara Melwani. Signs left on chairs around The Working Capitol. We even bothered with pep talks with lipsticks on washroom mirrors. And a label to go with your coffee. Evening Relaxation; nothing like a glass of rosé on the Garden to wind down the day. We also left several trails of quotes from our members around our spaces. Oh Look, We're Turning Four!